First released in 2001, the Dock on your Mac started out as a clean, useful, and innovative solution to keeping tabs on all the apps you’re running. Since then, a good dozen of Mac OS versions have been released, our desktops have become more cluttered, and tools we are working with every day much more complex. The Dock has had a good run, but today it just doesn’t respond to the needs of Mac power users. Luckily, there is a brilliant and powerful Mac dock replacement app — uBar – and it’s available on Setapp now. uBar takes all the best from the standard Dock and supercharges it with power features that let you work faster and monitor all the important aspects of your environment at a glance. Let’s walk through some of best customizations uBar has to offer. Unlike the typical Dock, uBar lets you see all the windows currently open for any given Mac Dock app and choose whether you want them stay separate or be grouped together. uBar can fit up to five rows of apps in its taskbar — just drag it out to see the maximum size. During you day, see how much CPU and RAM your apps are using by holding Control. For media apps, like iTunes and Spotify, uBar handily shows the progress bar for songs currently playing. And if any app goes unresponsive, you can spot it quickly as it changes background color in that case. 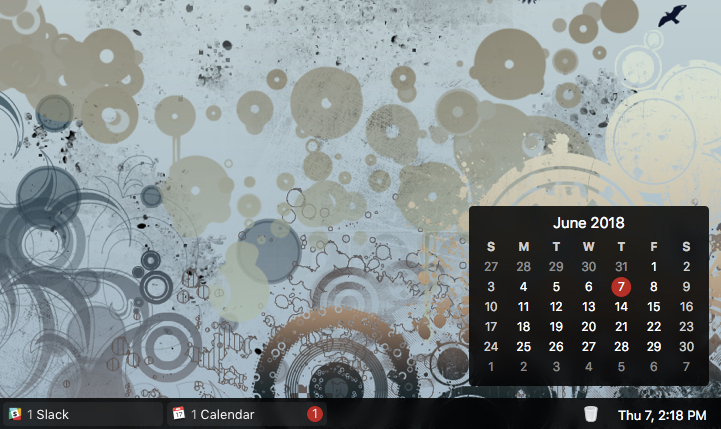 With uBar, you can format time & date to your liking and see them at the corner of the taskbar. And when you hover over, a quick calendar view appears. To launch the calendar, just click. If you have a multi-monitor setup, you can configure uBar to display a custom taskbar for each screen — perfect for creatives that use their monitors as distinct workspaces. You can change every little detail in your new Dock replacement. Choose whether it’s going to be a taskbar or a more typical-looking dock, decide on the order of the apps, select favorites, and much, much more. Finally, when you are settled on the functionality and know your way around uBar, don’t forget to polish its looks: from the position on the screen to pinned items to the exact color of every element — everything is up to you! Try uBar yourself through Setapp with a 7-day trial, along with 100+ other great Mac apps. Judging from the latest Apple keynote, it seems that the standard Mac Dock is not going to change for quite some time. Well, why wait anyway? Do it now.